This recipe isn’t for a dozen popovers, but instead, one large one to serve for brunch or a light meal! This is an easy, tasty dish anyone will love! This is a great popover recipe that includes veggies like Swiss chard and mushrooms (although you could probably use any of your favorites). Typically, the flour in this recipe would keep away those who are sensitive to gluten, but this popover recipe uses garbanzo bean flour to keep it gluten-free and delicious! Gluten can be found in many different foods and products, from ketchup to soy sauce to candy and seasonings. While SheKnows.com tries to ensure these recipes are gluten-free, carefully read the ingredient labels of all food and food products you use for these recipes to ensure they are also gluten-free. Add the olive oil to a large skillet over medium heat. When hot, add the onion and mushrooms and cook, stirring, until soft. Add the Swiss chard, garlic and seasonings, and mix well for a few minutes (be careful not to burn the garlic). Remove the mixture from the heat and cover it. Meanwhile, spray an 8-inch square baking dish (you could also use a pie plate) with the nonstick cooking spray. Add the margarine and place the dish in the oven until the margarine melts; then remove it from the oven. In a medium bowl, whisk together the garbanzo bean flour, milk and eggs. Pour the flour mixture into the baking dish and bake for 12 to 14 minutes, or until it becomes puffy and lightly browns. 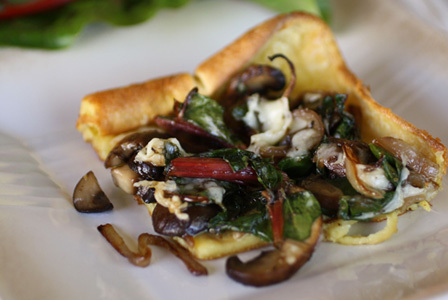 Spoon the Swiss chard mixture into the crust and sprinkle the Provolone cheese over the top. Bake for about 10 minutes or until the cheese has melted. Whether you’re looking for a light meal or a lovely dish for brunch, this dish is divine!